After the success of my first foray into Yves Rocher’s updated nail polish line, Botanical Colour Nail Polish (here are my previous reviews), I placed an order for a few more from their Summer 2015 collection: Aqua Blue, Iridescent Anthracite, and Pink Sherbet. Today, I’m reviewing Iridescent Anthracite / Anthracite iridescent (107), which looks pretty cool in the bottle. Being unfamiliar with the appearance of real anthracite, I thought the polish looked a lot like an oil slick, with its deep grey base and pinkish purple and olive green sheen. It turns out that there is such a thing as iridescent anthracite, after all. Anthracite is actually a lustrous, hardened version of coal, with fewer impurities (i.e., more carbon content) than other types of coal. It’s pretty shiny stuff. 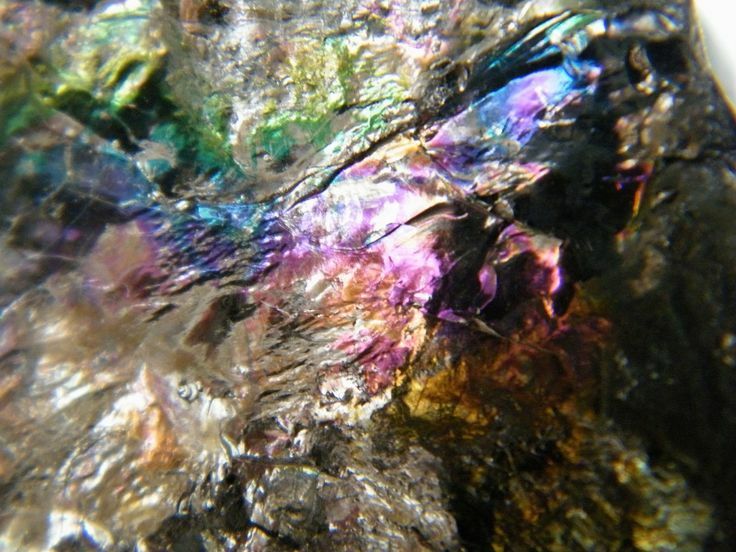 But iridescent anthracite often displays a rainbow of colors on its surface, like that you’d see in an oil slick. You can see similar swirling of purple and green in the bottle of this polish, but unfortunately, it doesn’t really show up on the nail. You can see a bit of the multi-colored shimmer in certain light, but it’s not a proper iridescent polish that flashes different colors at different angles. It’s still a nice color, regardless. The fine shimmer is packed, yet the polish gives off a subtle vibe. The overall look is an elegant, deep, slightly blue-toned grey shimmer with just enough of a metallic edge to it so that it isn’t totally boring. It’s a yay for me, but be aware that the bottle appearance is deceiving. 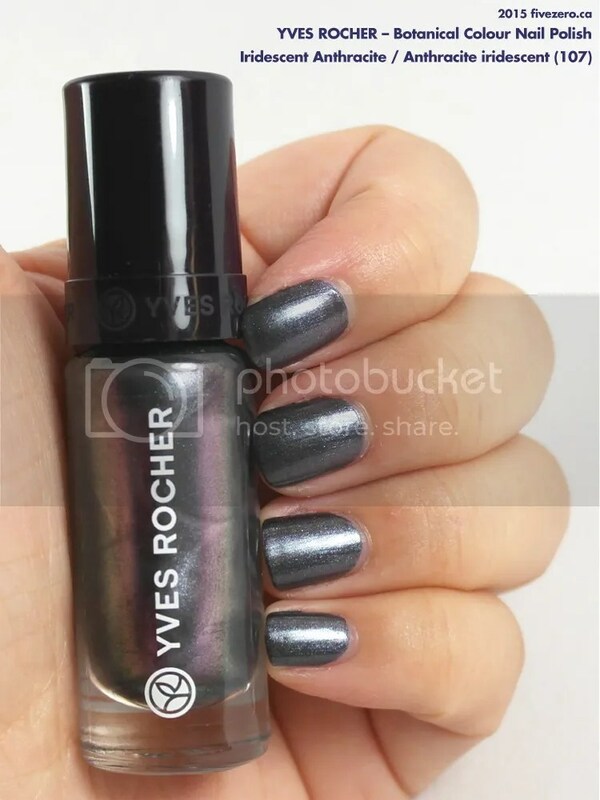 Yves Rocher Botanical Colour Nail Polish is 0.16 fl oz / 5 mL and retails for US$6 / CA$6 / UK£2.95 / EU€2.95. It is free of toluene, formaldehyde, and dibutyl phthalate (DBP), and it is made in France. I’m really loving these YR polishes 🙂 Thanks for visiting my blog! Woah, quite deceiving. Yeah, bottles can sometimes warp the finish in such a way that it looks like something completely different. Very pretty, though, and you’re right about that oil slickiness. It’s such a shame, but at least the color is still pretty nice on its own! What the heck! I was expecting a psychedelic sheer layering type of colour… but I actually quite like the grey colour. This might make it into my stash next year! For the price, you really have to! 🙂 But yeah, it’d be 100x more awesome if that iridescence was visible on the nail like it is in the bottle. Still, nice shade of grey. I like the grey, but I’m really surprised that it didn’t have that rainbow type sheen to it! Yeah, that was the only real disappointment. It looks so cool in the bottle! Very pretty and unique for sure! It’s a pretty great line so far, from what I’ve tried! I LOVE! Kind of reminds me of Essies For The Twill Of It!!! I LOVE THIS! I actually like the fact that it doesn’t look like what it looks like in the bottle (one of those sheer multichromes that show up too pinky-purpley), personally, I would have passed this one up based on the bottle! Yes, it is great that it’s SO opaque!